"It's like asking somebody: 'There's a 10-horse race - which horse is gonna win?'" "Up until these last six or eight months, I took a greater interest in it to see what was going on or trying to follow it. Now I’ve kind-of given up." 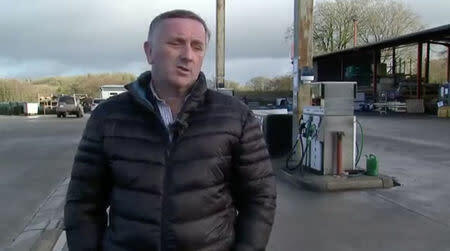 Fitzpatrick's station, which employs 20 people, has been running for two decades, and has more than once taken advantage of currency and tax fluctuations to offer cheaper fuel to people on one side of the border or the other; Ireland uses euros, Britain - pounds. Ireland's accession to the European bloc in 1973 removed the need for customs checks on the border. And a 1998 peace pact was based in part on removing the security checks designed to prevent both the militant incursions and cross-border smuggling that had bedevilled Northern Ireland during more than two decades of fighting between Irish nationalist and British "unionist" militias. Now, it is the effort to prevent the return of a "hard border" that has proved the biggest sticking point in Britain's attempts to negotiate a smooth, phased exit from the EU on March 29. If it fails, and Britain crashes out, Ireland will have little choice but to restore customs checks in short order. In the worst-case scenario of a hard Brexit, Fitzpatrick fears he may have to physically separate the fuel pumps and hardware stores on either side of the border. He jokes that he may have to build a "Trump-style" border wall. Not that there has been any official support to prepare for Brexit for the firm or its neighbors, Fitzpatrick said. "There's nobody getting help, whatsoever." "A week's a long time, as you talk about in politics. The week either side of March 29 could be a hell of a long time."